Today’s guest post comes from Erin O’ Leary, a graduate of the Clinton School of Public Service. 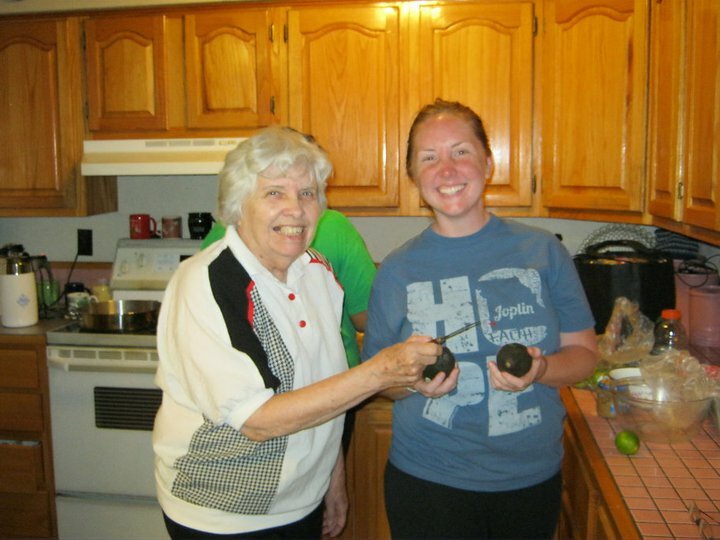 She’s served in AmeriCorps NCCC Class 11 and was also a Conservation Corps Crew Leader. 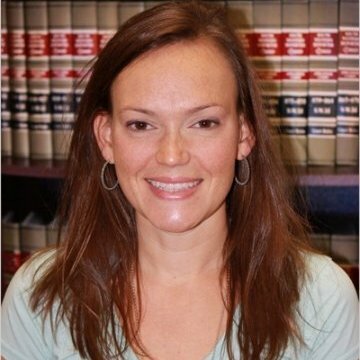 She’s currently a Staff Attorney at Center for Arkansas Legal Services. Last August, my good friend, Kate Raum, fellow alum from the Clinton School of Public Service, organized a service trip to her hometown. She grew up in Joplin and her extended family still lives on the land that has been in their family for generations. During the horrific storm and tornado of 2011, Kate was hunkered down in Little Rock, terrified for her family and community. Her only solace was knowing that her loved ones were all taking refuge in the back of her grandparents’, Frank and Maribel McCutcheon’s, home. Thankfully, her entire family and their homes escaped the tornado’s wrath; however, her community didn’t fare as well. When Kate organized the service trip, a bunch of our mutual friends and I gladly signed up to help. I was already in the middle of trying to mentally locate my grays and khakis when I found out that my former NCCC teammate and good friend, Annika Rigole, was going to be visiting that very same weekend. Too perfect! Always up for anything, Annika readily agreed and we found ourselves in Joplin, a couple of weeks later. 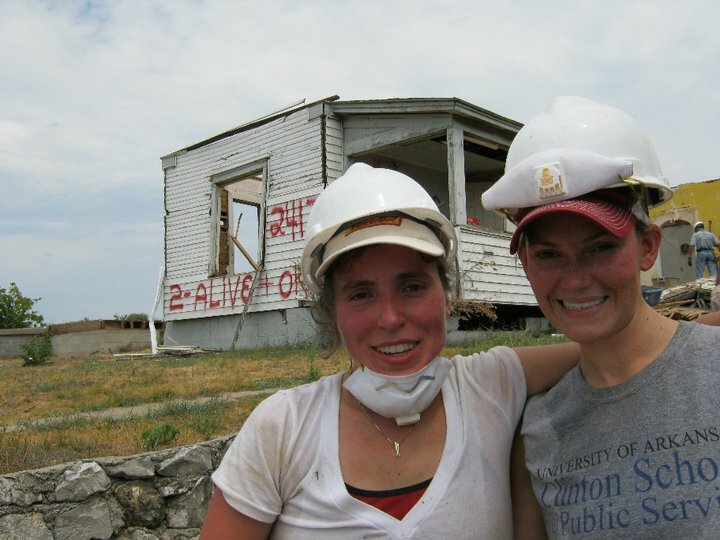 AmeriCorps members greeted us at the volunteer station and handed us hardhats, demolition tools, and a map to guide us to our project: a lone house still standing, in the middle of a field covered in barren, concrete foundations, collapsed buildings, and wind-stripped trees. Our job was to clear the house of the all its contents and begin the demolition process. We pulled up to the house, and the first thing we noticed was a spray painted message with the words, “2-ALIVE +OK”. Apparently the occupants survived the storm and ran out afterwards, with enough time to scrawl this across the front of their home, as they waited for help. The house seemed lonely, as it was one of only a few structures left on the once bustling neighborhood street. Moreover, since the tornado had flattened the entire neighborhood, the house now had a clear view of the hospital that had miraculously moved on its foundation to survive. More sobering was the condition of the inside of the house: completely full of everything a working home would have inside. Except now, everything had been toppled, broken, turned upside down, and left to rot in the summer heat for months, due to the evacuation and neglect. We set about shoveling up spoiled sacks of rice, broken dishes, and matted blankets and gingerly removing them through broken-out windows or in wheelbarrows pushed through door-less doorframes. Divulging the home of its goods, we lined them up along the side of the road for pick up by other volunteers. Once the rooms were cleared, we began to demolish the frame of the house. In one photo, you can see my friends and fellow volunteers Heather Malveaux and Anna Strong next to an entire wall that we were able to eventually pull down. By the end of the day, the house was ready for complete demolition, with the hope that, someday, the site would be ready for rebuilding. That evening, after showers and giant Sonic drinks, we enjoyed the fantastic hospitality of the McCutcheon family. We didn’t really talk about the tornado or go into gory details of the house we worked on. Maybe we all had enough sad stories for one day, and, in the case of Kate’s family, enough for a lifetime. However, what we did talk about was gratitude. 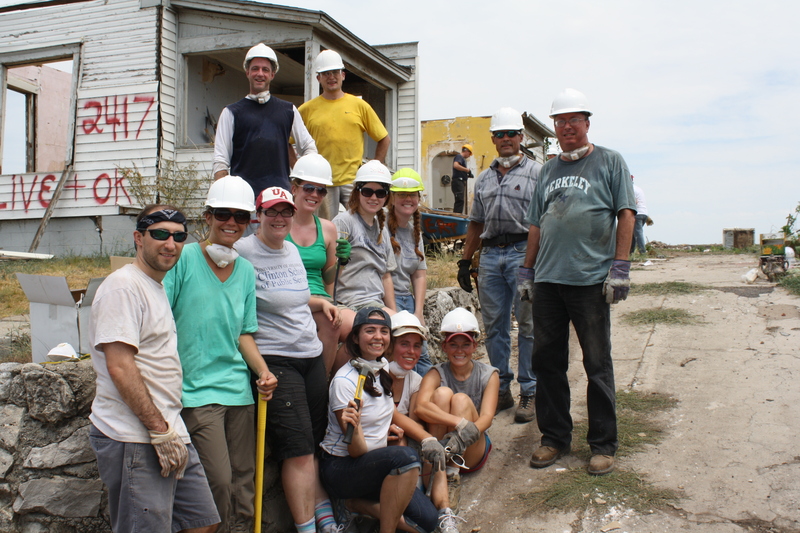 We, as volunteers, were so grateful for the opportunity to come and to serve in Joplin. Annika and I reminisced of our NCCC days, and found ourselves still amazed, all these years later, by the transformative power of service and humbled that we were welcomed into the community of Joplin and so warmly into the McCutcheon family home. Even more amazing was the fact the family, who had seen so much pain, was so grateful for and generous with what they still had. Driving home, Annika and I continued to recall our days in NCCC. We talked about who we were then, and who we are now, and how our terms of service impacted our lives. I know that most of us Alums truly believe that service transforms lives: those of the people served, and of those who serve.